This section of Camilla’s English Page contains teaching and study materials I’ve written, as well as links to resources on other websites covering all areas of English-language literature. Use the navigation menus to open pages devoted to specific literary categories. As a tutor, one of my favorite activities is helping students read, analyze, and write about works of literature in every category, from novels to poems. For many of these works, I’ve written notes, study questions, other exercises, and sometimes quizzes. You can find many of these materials on the pages for individual literary works. Project Gutenberg is a non-profit, volunteer effort to create free digital text versions of non-copyrighted works of literature and make them available to the public. As of 2018 it has made 57,000 ebooks available, including most major works of English-language literature published before 1923 (meaning they are no longer under copyright in the U.S.) and many other pre-1923 translations of major works of world literature. These ebooks can also be downloaded via services like Kindle and iBooks. Through its “partners, affiliates, and resources,” a total of 100,000 free ebooks are available. Project Gutenberg’s website even features free downloadable audiobooks, CDs, and DVDs. Please consider donating to Project Gutenberg if you have the means to do so. If you’re a student, one advantage of ebooks to keep in mind is that it’s much easier to find anything specific you’re looking by doing a search in an ebook than by flipping through a traditional book. 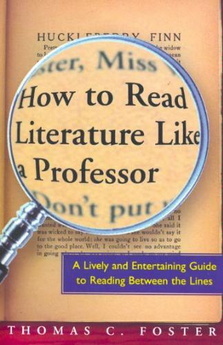 As a basic resource for help in understanding literature, students may find Thomas C. Foster’s How to Read Literature Like a Professor useful. For some of my students whose teachers ask them to annotate the texts they’re reading, I put together a brief overview of some important elements to focus on during the process of analyzing and reflecting on literature: Suggestions on How to Annotate Texts. This list may be useful to students doing literary analysis in any form, particularly analysis of a prose work like a novel, novella, short story, or play. On my Quizlet page I’ve put together a glossary of simplified definitions, suitable for studying in flash card form, for 53 of the most important literary terms for students to be familiar with: Basic Literary Terms. It includes common rhetorical devices, basic elements of literature, and major literary genres. On the website Virtual Salt, Robert Harris has provided useful definitions and examples of a great variety of rhetorical devices and literary terms. I highly recommend these pages as a resource for students looking for clear explanations of these concepts. 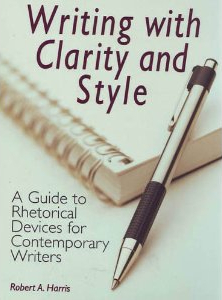 He has also published a well-reviewed book with even more comprehensive information about rhetorical devices: Writing With Clarity and Style: A Guide to Rhetorical Devices for Contemporary Writers.